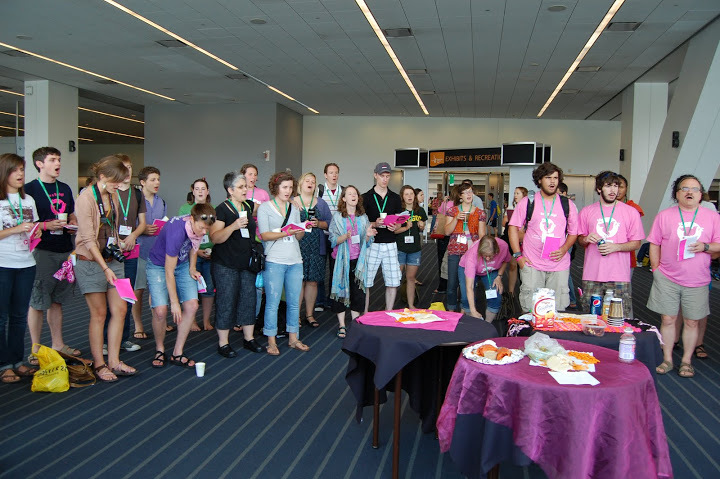 Offer prayers of thanksgiving that there will (finally) be a (convention-authorized) booth for Brethren Mennonite Council in the main convention hall. Go to that booth. Repeat as needed. Ditto for the Pink Menno room: Room 2504B (right around the corner from the Grand Ballroom on Level 2). When you go to the BMC booth and/or the Pink Menno room, pick up a list of the on-call Inclusive Pastors. Call one of us if we can help. At all. Really. Call. Show up whenever people are singing. Talk to people you don’t know. Learn their names. Find out about their lives. Why do they love the church? How are they trying to follow Jesus? What is their passion? If a conversation is bringing you joy, hang around and learn more. If it is making you crazy, walk away and shake off the dust. Make sure the other person sees you wipe the dust off the bottom of your shoe if that helps you feel better. Eat an M&M whenever you hear a favorite Executive Board buzzword. These include, but are not limited to: polity, missional, third-way, unity and polarities. If anyone starts to talk about “exacerbating polarities,” just go ahead and pop ten M&Ms in your mouth. When your M&Ms are gone, go to the Pink Menno room for the rest of the day. Pray every day. The psalms are a rich resource in how to pray when we are angry, scared, cocky, heart-broken, devastated . . . It’s OK to start with old-school smiting prayers. God can handle strong emotions. And swear words. If you can manage it, move on from there to more Jesusy prayers. If all else fails, recite the Lord’s Prayer. Until you mean it. Prayers and blessings to my brothers and sisters in Mennonite Church USA from a progressive Menno in Canada. Thanks for the reminder to pray as you meet next week in Kansas City.